This is an inkjet head that is completely makable in a RepRap machine. It was inspired by Johnrpm's Scratchbuilt_Piezo_Printhead. It has only three reprapped parts. The other parts are standard easily-obtainable items. There is no machining involved in making it - the only tools needed are scissors, a scalpel or razor blade, a hammer, a short piece of 3 mm steel rod to use as a punch, and a glue gun. It uses a piezoelectric buzzer to drive the ink. 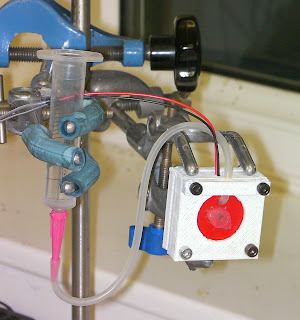 Reprappable inkjet head from Adrian Bowyer on Vimeo. Adrian looks cool. Something I have been thinking about for a bit but never got around to. Well done. I have used the LT700 audio output transformers (maplin amongst others) for a few step up applications by driving the secondary. I seem to get a step up of around 10 to 1 or more. (never really calculated it properly). For a 12v feed this should be sufficient after rectification and reservoir to give you a useful 100v+ supply that can be switched using high voltage transistors. Cheap cheerful and readily available.